It is one of the more insidious realities well known to the country’s elite. Clog the arteries of justice with ‘clever’ lawyering and appeals, and you can significantly reduce your chances of ever being found guilty. The logic is simple enough. The National and Supreme Courts are slow moving. Process can be abused in multiple ways to exploit this fact. Through such techniques a Leadership Tribunal hearing or criminal prosecution can be pushed back a decade. In which time witnesses move on, or die. Their oral testimony becomes less vivid and more open to question. Documentary evidence trails go stale and key files go missing. There is also the possibility that over-stretched state solicitors will drop the ball or make a mistake, that will be leapt upon by high priced silks flown in by the litigant from Australia at a premium. The case file will also pass through the hands of multiple government lawyers over this period. Each time they have to familiarise themselves with the facts and details. This increases the chance that they will indeed drop the ball, or at the very least understandably will be less prepared than the rival legal team who has the benefit of being over the case case file since its inception. During this time the elite can hold high public office and conduct business in a governance environment that is tainted with the odour of injustice. If the case falls over, the politician pumps their fist into the air claiming they have been vindicated. The public is none the wiser about the murky reality behind their so called vindication. If the proceeding against them continues, the stress caused by the substantial delays which the offender actually strategically caused can then even be used to mitigate the sentence handed down by the court. We have also seen recently how high profile individuals can escape custody by paying restitution to the state, even when this restitution comes from the bank account of a foreign ‘friend’ who heads a company blacklisted by the World Bank for fraud. Set against this problematic reality, a recent case has come to light which graphically displays how this game is played. Even as this article is published, Patrick Pruaitch has just filed yet another Supreme Court appeal. It will further prolong his nine-year battle to avoid a Leadership Tribunal hearing. The Leadership Tribunal was requested in 2009 to adjudicate on allegations of misconduct in office. A long line of eminent judges have repeatedly dismissed Pruaitch’s ‘clever lawyering’ as ‘premature, without merits and an abuse of process’. The latest appeal filed by his legal team is his fifth application to the Supreme Court and his seventh court case in total. 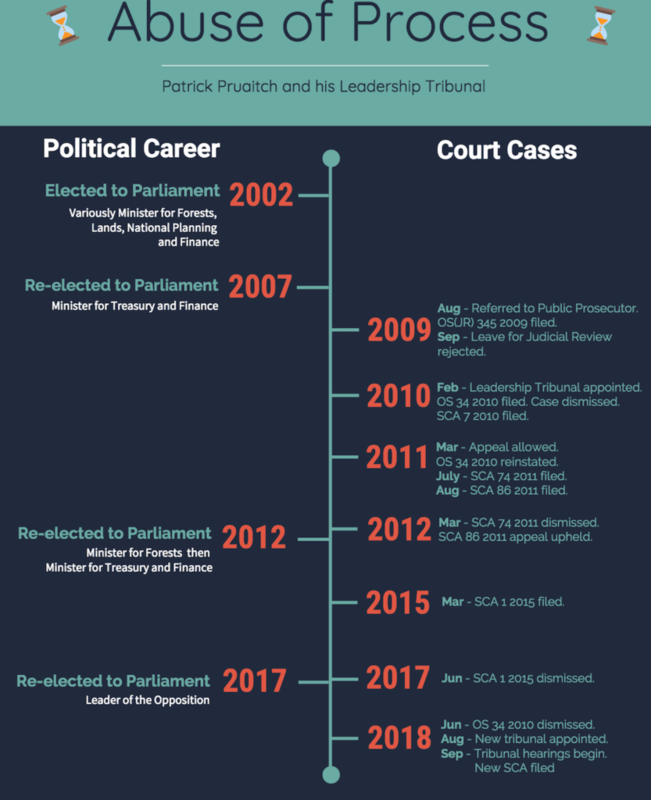 While abusing process to avoid the Leadership Tribunal, Pruaitch has twice been re-elected to Parliament (2012 and 2017) and has served as both Minister for Forests (2012-14) and Minister for Treasury (2014-17). He was most recently Leader of the Opposition. As the Supreme Court warned in 2017, during one of Pruaitch’s earlier appeals, ‘delays in the prosecution of leaders charged with misconduct offences undermine good governance and the public loses confidence in the systems of government’. Despite this admonishment, Pruaitch, like others before him, shows no signs of giving up on his attempts to derail justice. On 19 June, 2018, Justice Polume-Kiele gave her ruling on two applications before the National Court in a long running legal battle between the Member for Aitape Lumi, Patrick Pruiatch, and the Ombudsman Commission. One application was from Patrick Pruaitch. It sought an order that certain Constitutional questions be referred to the Supreme Court for interpretation to determine if his referral to a Leadership Tribunal during August 2009 was valid. The other application was made by the Ombudsman Commission (OC). It sought to dismiss the entire case brought by Pruaitch against the OC on the grounds that it is ‘frivolous or vexatious and an abuse of the process of the Court’. This court case was just one in a long line of cases filled by Patrick Pruaitch in relation to his referral by the Ombudsman Commission. Pruaitch initially argued his referral by the Ombudsman Commission to the Public Prosector should be ruled unconstitutional and invalid because he was not given a right to be heard before the referral was made. It is an argument he put forward in a court case filed during August 2009, immediately after the OC referral. In September 2009 the National Court (Hartshorn J.) refused the application for leave to review. It found that Pruaitch, contrary to his claims, had in fact been afforded ample opportunity to be heard. The National Court also concluded that as the Tribunal had yet to hear his case, any application was premature and misguided. A Leadership Tribunal was then appointed during February 2010 to hear the case against Pruaitch. However, the Tribunal was prevented from convening for a further eight years – and counting – by ‘clever lawyering’. The day after the tribunal was appointed, on 4 February 2010, Patrick Pruaitch filed his second court case. In the first case Pruaitch appealed the referral from the Ombudsman Commission to the Public Prosecutor. This time an injunction against the Leadership Tribunal proceeding was sought. On 12 February, this second case was dismissed by Justice Kariko as an abuse of process. It effectively raised the same issues that had already been determined in the first case. Pruaitch immediately filed an appeal to the Supreme Court. Seven days later he obtained an ex parte order from Justice Sevua. It restrained the Leadership Tribunal from sitting. In March 2011, after a delay of nine months from the date of hearing, the Supreme Court (SC) announced its decision to allow the appeal. The SC quashed the February 2010 orders of Justice Kariko, reinstated the National Court case and continued the injunction preventing the Leadership Tribunal from sitting. It would take more than seven years though before that reinstated National court case would be finally determined by Justice Polume-Kiele. It was a delay caused by years of manoeuvring by the plaintiff and some tardy case load management by the courts. In June 2011 Justice Kandakasi issued directions on how the reinstated national court case should proceed. Days later, Pruaitch filed an application for leave to appeal the directions orders. This was now the fourth court case he had instigated. Pruaitch was granted leave to appeal and the National Court case was halted until the appeal was heard. In the meantime, on 26 July 2011, Justice Kandakasi in the National Court recalled the National Court case and vacated the directions orders he had made in June. Pruaitch immediately also appealed Kandakasi’s new decision to the Supreme Court, meaning he now had two SC appeals on hand. In March 2012, the Supreme Court dismissed Pruaitch’s original appeal against the directions orders. The SC also quashed Kandakasi’s July decision to vacate his original orders. As a result the original directions orders made in June 2011 still stood, but another nine months of delay had been added. Then, during September 2012, Pruaitch filed a new motion in the reinstated case, seeking discovery of certain Ombudsman Commission investigation documents. Although that application was heard in October 2012, Judge Kassman delayed more than two years until December 2014, before delivering his ruling. The decision, when it finally came, rejected Pruaitch’s application for discovery of the documents. Almost four months later on 31 March 2015, Pruaitch filed … yet another appeal in the SC (his fourth). This time challenging Justice Kassman’s decision. Leave to appeal was granted and the case was heard during December 2015. Again there was lengthy delay while the court deliberated. This time the wait was 18 months, with the ruling delivered during June 2017. But the decision was the same, the appeal by Patrick Pruaitch was again dismissed. The Supreme Court was damning of Pruaitch and his approach to the whole matter. The SC said it was not in the public interest generally for the proceedings of the OC to be subject to other civil proceedings. The court described it as an ‘an undesirable judicial development which has to be discouraged’. In particular, the SC said ‘it is against the public interest for a Leader to interfere midstream with a proceeding under the Leadership Code’. According to the Supreme Court, Pruaitch’s whole court action was ‘instituted prematurely’. It was stated the MP should wait to see if he was found guilty before challenging the process. The SC raised questions over the motivations behind this proceeding for discovery. It was observed that while Pruaitch was seeking discovery of certain documents relating to the investigation and meeting minutes, he was not seeking discovery of other documents which ‘are the very basis’ for the whole proceedings. The SC court said it was ‘unable to the see the reasons why’ Pruaitch was seeking discovery of OC meeting minutes. Ombudsman investigations are under law, private and such privacy would cover any meetings. ‘In any case’, the court observed, ‘meeting minutes are not evidence. It serves no useful purpose for meeting minutes to be provided’. In relation to the investigation documents, the Supreme Court noted ‘it is in the public interest the proceedings of the Commission, or the Leadership Tribunal should not be compromised and tampered with’. ‘It is not in the public interest for these materials to be released and used by the Appellant in an irrelevant proceeding’. In conclusion, the SC said it appeared Pruaitch ‘does not have any evidence to support his claim’ and there was, on the facts before it, no breach of procedural fairness as argued. The whole history of the case, said the Supreme Court, was ‘a negative indictment on the rule of law’. Here it needs to be noted that the above National and Supreme Court proceedings related to discovery of certain documents. No decision had yet been reached on Pruaitch’s submission challenging the appointment of the Leadership Tribunal, which had been made during 2010. This provided the opportunity for further delays. Finally, on 5 February 2018, eight years and two days since the appointment of the tribunal, and after the delays created by four unsuccessful Supreme Court challenges, the case against the Leadership Tribunal proceeding finally had its day in court. Mal Varitmos QC, overseas counsel from Brisbane Australia, was flown in by Patrick Pruaitch to present his case, as he had in the SC in 2017. The court’s verdict though was again damning. In its decision, announced on June 19, the court endorsed and followed the earlier decision of the Supreme Court. The whole court case instigated by Patrick Pruaitch was ‘premature, without merits and an abuse of process’. As a result said the court, the Leadership Tribunal should proceed ‘without delay’. But again Pruaitch has ensured that this will not happen. It immediately faced further delays. New objections were raised by Pruaitch’s lawyer, Greg Sheppard, and the tribunal was adjourned for a week. It promptly met again on 11 September, but made no further progress. Instead the Tribunal was again indefinitely suspended to await the conclusion of a NEW SUPREME COURT APPEAL lodged by Mr Pruaitch against the National Court decision handed down in June. This is despite the earlier admonishments of the Supreme Court in 2017. The public are observing one of the most frustrating examples of legal ping pong in the history of our court system. Again further opportunity is being created for the state lawyers to misstep in the face of their high priced adversaries. Again further opportunity is created for personnel to move on, witnesses to fade, and for documentary trails to be eroded. Each delay increases the chances that the Leadership Tribunal case will fall over. It is yet another example of how the rule of law is being parodied by our political elites.